St. Anastasios of Sinai was a monk of the monastery at the foot of Mount Sinai when Saint John Climacus was abbot there. In his Narratives, he offers us the following biographical information about his spiritual father, primarily about a prophecy at his tonsure and the appearance of the Prophet Moses at the monastery refectory. 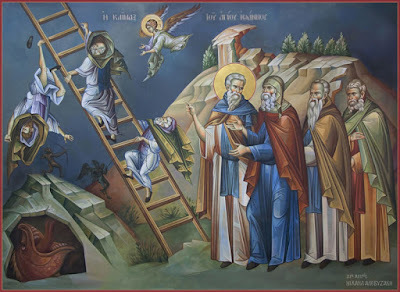 Abba Martyrios, when he tonsured our venerable father John the abbot at the age of twenty, took him and went to that pillar of our wilderness, Abba John the Sabbaite in the wilderness of Gouda where he had with him his disciple Stephen the Cappadocian. When the Sabbaite elder saw them he rose and took water, put it in a small basin, washed the feet of the disciple (the young John) and kissed his hand; but he did not wash the feet of Abba Martyrios his superior. Abba Stephen was scandalized by the situation. After the departure of Abba Martyrios and his disciple, Abba John noticed that his own disciple was scandalized and said to him: “Why are you scandalized? Believe me, I don’t know who the boy is, but today I received the abbot of Sinai and washed his feet.” After forty years he did indeed become the abbot according to the prophecy of the elder. Not only Abba John the Sabbaite but also Abba Stratigios the enclosed who never came out appeared on the day when Abba John was tonsured.